Saturn is the sixth planet in the solar system, between Jupiter and Uranus. 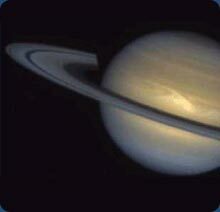 Saturn is the second largest planet in the solar system. Similar to Jupiter, it is made of gas, which makes it the lightest planet. Saturn is so light that it could float in water. The planet is encircled by thin rings which are over 160 thousand miles in diameter. These rings appear from a distance to be solid, but are in fact made up of billions of snowballs. Saturn’s moons keep the rings in a banded pattern. There are at least 18 moons belonging to the planet. One interesting moon is Titan, which is surrounded by its own atmosphere. This contains a lot of nitrogen, similar to Earth’s atmosphere. It is possible that Titan has liquid water on its surface. Saturn itself has no solid surface, as the planet is mostly made of hydrogen and helium. The planet is so far from the Sun that it takes more than 29 Earth years for Saturn to orbit once. A day, however, is shorter than an Earth day, as Saturn makes one full rotation about every 10 hours.